Welcome to our guide to Blackpool Sands, with all the information you need to plan a fantastic day at this Blue Flag beach. Jump to a section by choosing a quick link or read on for the full guide. So… what is a ‘Blue Flag’ beach? For the benefit of sat nav users, the postcode for Blackpool Sands is TQ6 0RG. Blackpool Sands is just under four miles from the centre of Dartmouth. Continue downhill as the road becomes lined with forest. The left turn to the beach is easy to miss amongst the trees, so look out for two bus stops facing each other about 20 metres before the turning. Continue along this coastal road which will eventually turn away from the water and wide its way up and down hill through Strete. You will cross a small bridge and begin your ascent uphill. 200 yards past the bridge, you’ll see the entrance to Blackpool Sands on your right. There is ample parking at the beach. From mid-March to the end of October, it is manned by an attendant and there is a charge which varies through the season, you can check the current rate by calling the information line on 01803 771800. From November to mid-March parking is free. 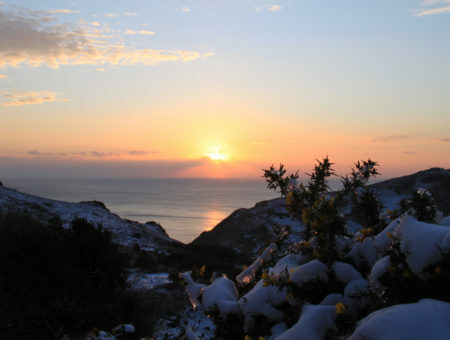 There are no vehicle height restrictions but overnight parking and camping are both forbidden at Blackpool Sands. 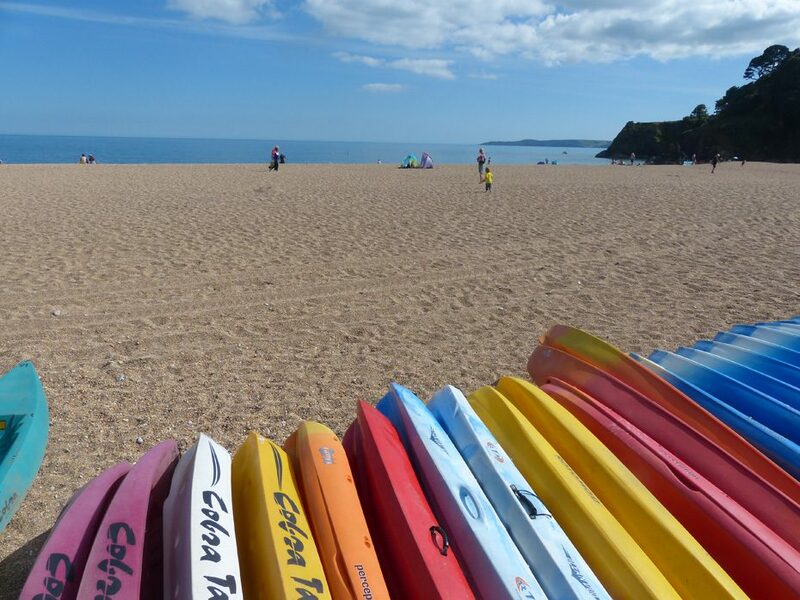 As a Blue Flag beach, Blackpool Sands achieves the highest standards in terms of its environment and the facilities provided. What makes a ‘Blue Flag’ beach? We’ve all heard of the Blue Flag award, but what does it mean, and what does it tell us about Blackpool Sands? The Blue Flag programme is administrated by the Foundation for Environmental Education (FEE), a non-governmental organisation based in Copenhagen. It was founded in 1987 as the ‘European Blue Flag’, and grew beyond Europe when South Africa joined in 2001. It’s now considered the most stringent eco-label for beaches, marinas and boat tour operators in the world. The inspection regime is based around 33 strictly enforced criteria. These are divided into four categories. Blue Flag beaches must display information about the Blue Flag programme to visitors, and post details about the beach and the eco-system as well. They also have a duty to provide regular activities to teach beachgoers about the local environment. They need to display information about the quality of the bathing water, and provide a map that explains where all the facilities are located. Finally, a code of conduct must be created and displayed in an accessible place. This is perhaps the most famous set of criteria, as we all associate the Blue Flag with a pristine, safe environment. Every Blue Flag beach must have excellent bathing water quality, and be unaffected by industrial or other pollutants. As a Blue Flag beach, Blackpool Sands is assessed regularly (at intervals of no longer than 31 days) in accordance with the strict requirements laid down by the FEE. 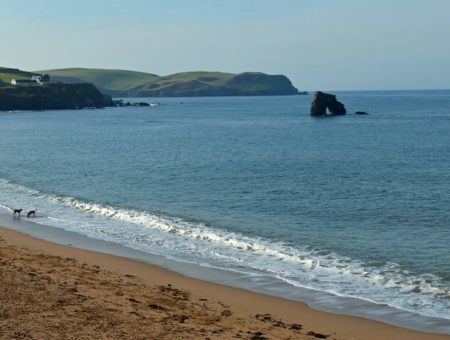 As you’d expect, the standards in this category are extremely stringent, so you can be assured, given that Blackpool Sands has held its Blue Flag status for many years, that it has one of the most pristine coastal environments in the region. Blue Flag beaches are required to have a beach management committee that oversees the health of the environment, and the site must be managed both sensitively and in accordance with all laws and regulations. The beach has to be clean and free of litter and man-made debris; however, natural debris and algae has to be left in place. To help maintain the cleanliness and beauty of the beach, adequate bins and recycling facilities must be provided. Toilets and restroom facilities must be adequate in number and maintain a high state of cleanliness. In Blackpool Sands, the owners have gone one step further and provided useful outdoor showers too. Sensitive habitats on or around the beach must be carefully monitored, buildings must be maintained to keep up the overall appearance, and Blue Flag beaches are even required to promote sustainable means of transport to the site! In practice at Blackpool Sands, this means either taking a bus (see the “Public Transport” section) or on foot – the hike from Dartmouth along the South West Coast Path is especially popular. Blue Flag beaches must be assessed for risk, provide first aid facilities and have emergency response plans to deal with pollution in place. Safety measures must be taken and disabled access must be provided. Drinking water must also be provided. It’s no surprise, given how demanding these requirements are, that relatively few beaches make the grade. Blackpool Sands is one of an elite club of 68 Blue Flag beaches in England. For further details, see the Blue Flag criteria here. 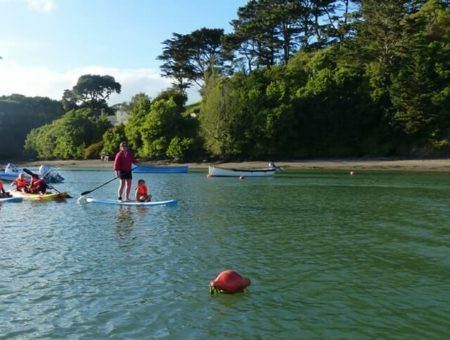 You can hire sit-on-top kayaks, Stand-Up Paddleboards (SUPs), wetsuits and buoyancy aids from the Venus Company at Blackpool Sands (seasonal). SUP prices are available for £15 per hour or £20 for two hours, including buoyancy aids. You can also hire an SUP for the day for £40, or £140 for a week*. For sit-on-top kayaks, the price depends on the size of the kayak. All costs include buoyancy aids. Beyond hiring equipment, kayak tours can also be arranged for groups up to 10. Call 01803 712648 for details. Here in the South Hams, we are lucky to have some of the best beaches in the country on our doorstep. With such a stunning coastline, it can be difficult to choose where to go for the perfect day out. Blackpool Sands, which has been awarded a prestigious Blue Flag, is one of the most popular beaches along the South Devon coastline, particularly with local residents. Blackpool Sands is just under four miles from the centre of Dartmouth, found between the villages of Stoke Fleming and Strete. This is a fantastic beach for families with a Summer lifeguard patrol, beach shop and the Venus café situated right on the beach. It should also be mentioned that the Venus café is not a typical ‘chips-in-a-cone’-style beachside kiosk. While you can find all the casual classics you’d expect in their takeaway menu, there are also organic meats, a fine range of salads and some enticing seafood options in the café. The coffee served is also organic and Fairtrade. You can visit the café for dinner as well as breakfast and lunch, provided you book in advance. Given the beach’s historical name, some may be surprised to read that Blackpool Sands is in fact a fine shingle beach. In many ways, this is actually a bonus – no sandy sandwiches and scratchy towels to worry about! Fortunately, if you’re bringing children with you, there are two large sandpits during summer months so that they won’t have to miss out. During July and August there is also a bathing raft which is brilliant fun to swim to and jump in and out of the sea. The beautiful turquoise sea is fantastic for swimming, kayaking and other water sports as it is often very calm and protected in the bay with a gradual sloping sea floor. You can hire wetsuits, kayaks, paddleboards and much more at the beach, which adds something extra to your day and gives you the opportunity to try something new. One of the nicest things about the beach, aside from the breathtaking views, is the attention paid to the facilities, which are some of the best in the area. The toilets and showers are well maintained and the shop sells all the beach-related goodies you’ll need, including buckets, spades, inflatables and swimwear. The ample car parks are located right next to this beach so there is no need to worry about having a long walk from the car. The beach is also accessible by bus: the No. 3 service runs between Dartmouth and Plymouth and stops just a few yards from the entrance to the car park. Blackpool Sands also has disabled access onto the beach as well as disabled toilets, so there is very much a feeling that no stone – or perhaps we should say no grain of shingle – has been left unturned to provide a fantastic day out to every visitor. So, if you are looking for a beach with everything you may need for a brilliant day out – take a trip to Blackpool Sands! In the summer during the day, Blackpool Sands’ popularity amongst swimmers, Stand-up Paddleboarders and other visitors means that shore fishing is only permitted in the evening but do please take all your hooks and nets away with you to avoid injuries the next day to beachgoers. Outside of the holiday season, it’s a great place to fish, both because of the nice range of species and conditions you can encounter from this compact cove and because of the fantastic views of Start Bay to enjoy. Close to the rocks at either side of the beach, wrasse are plentiful, but most of the UK’s southern shore-dwelling species are caught here: pouting, whiting, dabs, plaice, garfish, bull huss, lesser-spotted dogfish and bass are frequently reeled in from Blackpool Sands. In the summer evenings, it’s a fantastic place to feather for mackerel too. For a little more space to spread out, consider nearby Slapton Sands which stretches for three miles and offers similar conditions. Dogs are permitted with some restrictions outside these dates. If in doubt, please call the Blackpool Sands team on 01803 771800. As well as a much-loved place for lunch throughout the year, Venus Café and Takeaway at Blackpool Sands is also a popular venue for weddings and receptions. The menu consists of fresh, locally sourced dishes, from Devon Cream Teas to fish cakes and succulent beef burgers. There’s even an extensive selection of beers and wines, and many of the food and drink options are organic and/or Fairtrade. Venus Café is a great example of what’s special about South Devon – it’s a world away from sandy sandwiches and chips in a cone! You can see the full café menu here. For all the takeaway options, download the takeout menu. Perhaps you’re only planning to pick up an ice-cream? Once again, the choice is extensive. Take a look at the ice cream menu at Venus here..
Blackpool Sands is home to a couple of annual events, with others scheduled on an occasional basis. The swim starts at the west end of the beach and proceeds diagonally across the sheltered bay, before returning to the shore. Starting with a steep climb up to Strete, the run then carries on downhill to Slapton Sands, and proceeds around the Stokenham roundabout, before retracing the route back. The final leg is a four-lap run of the fields behind the beach. On Saturday 8th July 2017, from 8.30 am until 11 pm, the Venus Company launched the first Loving the Beach Fest. The day included a line-up of musical acts, Mafia 4, Three Bags Full and Saloon Star, tasty local food and a Bays Brewery drinks tent. Regular tickets were priced at £15, while VIP admission (which included a three-course set menu) was £45. We’ll post an update as soon as the organisers confirm whether the event will go ahead in 2018. For a holiday by Blackpool Sands, consider a luxury break at Seaway House in Strete, a beautiful three-bedroom detached house, just a few minutes’ walk from the stunning Start Bay coastline. This historic harbour town and popular holiday destination is just four miles from Blackpool Sands and the Start Bay coastline. Blackpool Sands sits at the northern end of Start Bay, a 15-mile stretch of coastline incorporating expansive fine-shingle bays and little unspoilt coves, as well as hours of wonderful walks on the South West Coast Path. Home to top restaurants like the Laughing Monk at Strete and an array of popular pubs such as the Start Bay Inn in Torcross, this is a wonderful region for a break. Explore more of South Devon’s beaches with our South Devon Beach Bible.